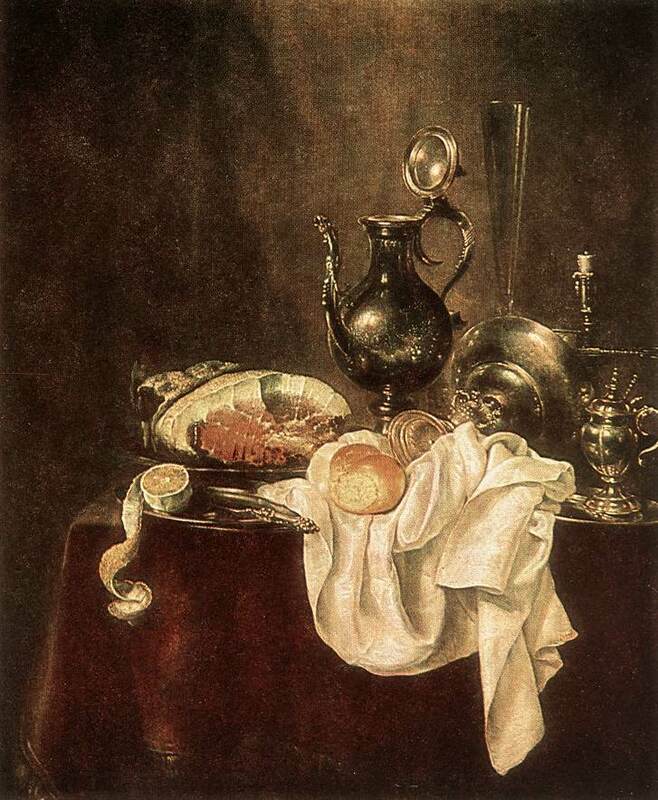 Heda s earliest dated work is a Vanitas (1621; The Hague, Museum Bredius), which shows a still-life from a high viewpoint, composed of various objects bearing vanitas associations (e.g. 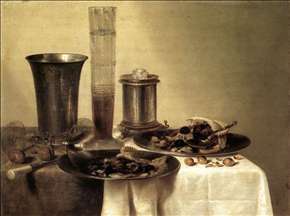 a bowl of glowing embers, smoker s requisites, an overturned glass and a skull); the colouring is in brownish-grey tones and represents one of the earliest examples of a Dutch monochrome still-life ( monochrome refers to the range of tones, rather than of colours). 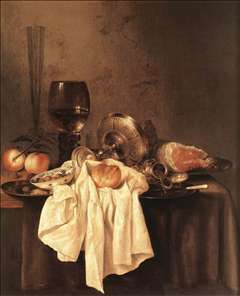 Even in this early work Heda s skill at painting textures is evident. 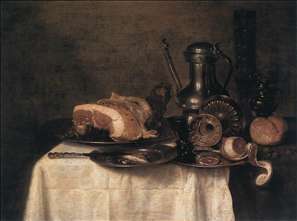 A more balanced composition is achieved in another Still-life (1629; The Hague, Mauritshuis) and in the Breakfast Table (1631; Dresden, Gemldegalerie), in both of which the objects, set against a neutral background, are linked by a strong diagonal. 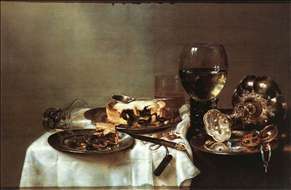 In 1631 he became a member of the Haarlem Guild of St Luke (of which he served as deacon on several occasions after 1637). 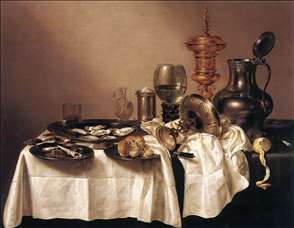 After 1640 Heda s compositions became larger, richer, and more decorative (e.g. 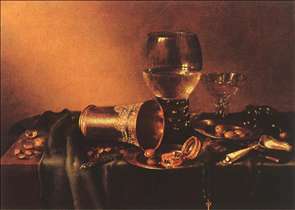 the still-life in the Hermitage, St. Petersburg). To obtain a more monumental effect, during his maturity Heda often abandons the traditional horizontal format for a vertical one. 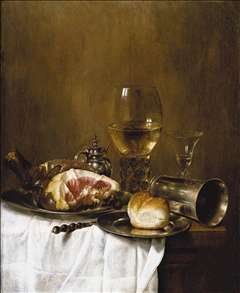 Ornate silver vessels and costly Venetian glasses intensify the contrasts of valuers , and touches of colour provided by the pink of sliced hams and ripe fruit are combined with an increased chiaroscuro. 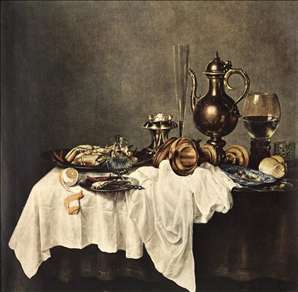 The monochromatic style was also practiced by Heda s son Gerrit Willemsz Heda (before 1637-c. 1702), who worked closely in his father s manner. 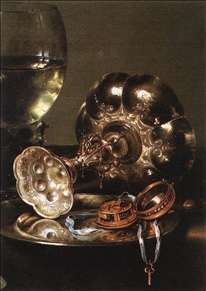 See more details about "Breakfast Still-Life"
See more details about "Breakfast Table with Blackberry Pie"
See more details about "Breakfast Table with Blackberry Pie "
See more details about "Breakfast of Crab"
See more details about "Still-life with Gilt Goblet"
See more details about "Ham and Silverware"